Are you in the market for a new vehicle that has enough room for the whole family? The Explorer from Ford has three rows of seating to provide room for seven passengers. The 2019 Ford Explorer is now available to you at Wolf Auto Center. It has plenty of features and doesn’t have a bad angle. Drivers interested in the 2019 Explorer will have the choice between eight different exterior colors and five different trim levels. Trim levels consist of the Explorer, XLT, Limited, Sport and Platinum. Each trim level starts at a different price and has a different standard set of features. This allows each driver to find a model that fits their needs as well as their budget. Depending on which trim level of the Explorer you decide on, it will be equipped with one of three available engines – 3.5-liter EcoBoost®, 2.3-liter EcoBoost® and 3.5-liter Ti-VCT V6. 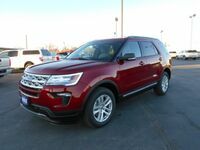 Continue reading to learn more about the 2019 Ford Explorer or click on the button below to view our current Explorer inventory! No matter where you travel in the Explorer, you will be noticed. The dynamic front grille and distinctive LED front and rear lights give your Explorer the look you desire. Inside the 2019 Explorer, drivers will find a stylish interior with plenty of details to show it was carefully designed. The 2019 Explorer has plenty of power to tow your trailer with ease. The standard trailer sway control selectively brakes and adjusts engine power to maintain the most control of the trailer. When the 2019 Explorer is properly equipped it can tow up to 5,000 pounds. There is no shortage of technology in the 2019 Explorer. The available Ford Safe and Smart™ Package provides rain-sensing wipers, auto high-beam headlamps, Lane-Keeping System that helps detect and alert you to vehicle drift, forward collision warning with brake support and adaptive cruise control. It is easy to connect your compatible smartphone so you can access your favorite apps while you are on the go. A new feature is Ford + Alexa which brings the impressive capabilities of Amazon Alexa along with you on the road! The 2019 Ford Explorer has plenty more to offer. Be sure to stop by the dealership today or click on the button below to receive more information!